My birthday on the 17th was very special. There’s nothing like a day at the CBS Studios watching a taping of RUBY & THE ROCKITS, with Shaun in sight for most of the show, & Ryan giving me a B-day kiss on the cheek! 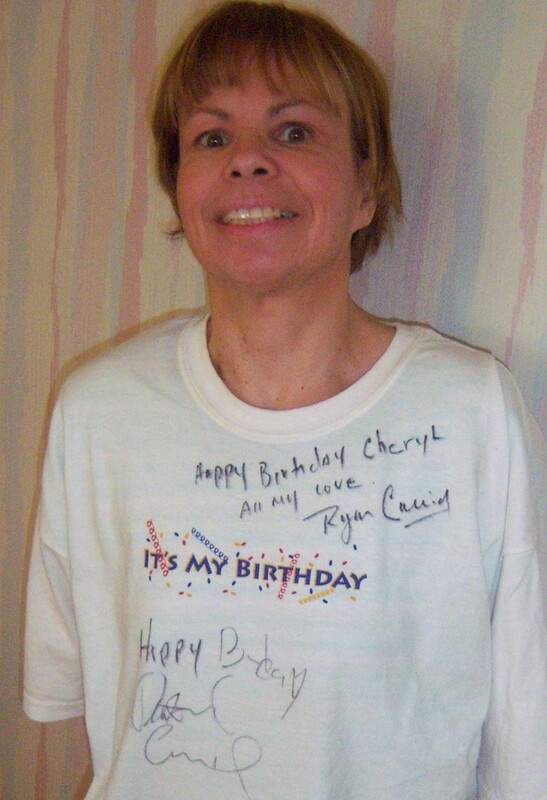 I had planned to wear an “It’s My Birthday” t-shirt I got at a casino, but it was too big, so I brought it in my purse & used it to cover my shoulders. Ryan saw it during one of the breaks & asked me when my birthday was. I told him it was that night, & he was happy to autograph it. Later, he came out & gave me the kiss (with wife, Bonnie, close by!). After the taping, Patrick also signed it, to the dismay of ushers who were trying to push us out the door before I could get Shaun’s attention (I plan to try next week, by passing it through the audience co-coordinator). I was able to say hi to Caitlin & Shirley, & caught quick glimpses of Caleb & Melissa. I did find out that SHAUN wrote Lost in your own Life, although it’s strange he doesn’t get song credit on I-Tunes. He also wrote another song, You Are Where I Live, which was originally used as a love song from Dusty to Terry when Shaun guest-starred on General Hospital in the late 80’s. He’s also written all the songs used in the Rockits videos. Listen for his voice-overs in the show (he appears in the pilot & taped one for episode 5, which might be used in the final edit! This episode showed off Patrick, strength, as he did take after tape of carrying “Addie” into the kitchen with her wrapped around him in a passionate hold. A friend remarked that she wouldn’t mind taking Katie Kean’s place! He managed to hold her in the same position (for continuity), even backing up with her! I also promoted the club through my :new friend,” Roger, when he asked me to speak! I thank him for his support, as well as David’s assistant, who set up the wonderful VIP seats! Now Playing: What a day! Nov 1st turned out to be quite a family affair for the Cassidys, when wives, children & close friends filled the far left section of the bleachers of Studio 10 of the CBS Radford complex. My parents & I checked into the historic Sportsman’s Lodge to freshen up. I chose a turquoise pair of slacks, with a turquoise & brown splash t-shirt & blue sweater, in case we managed to get on camera, and my parents were equally dressed up. We left at 2:30 for the studio, because I wanted to get there as the parking lot opened, to assure a good parking space & getting at the front of the line. The plan worked, because we were the first ones let into the studio, although we were standing in line about an hour before we were let in. The guard let us down Gilligan’s Island Way to the studio. I parked my walker at the foot of 3 steps, and we were split up. I was seated on the right aisle in the first row, while my parents were seated further in one row up. Our section was in front of a casino lounge set, and they placed the most appropriately dressed members of the audience there, in case the cameras caught us while shooting the extras. From where I was sitting, I had a good vantage point of seeing the various members of the family. I saw Beau, & asked him to give his dad & uncles the newsletters I hand-carried to the studio. I also gave a copy to Jake, who was there to support his father. I said hi to Melissa, who was there with sons Cole (sporting an orange cast on his arm from a football accident) & Jack, & introduced myself to Tracey. I had heard rumors that she was pregnant, & now can officially confirm that she is. Ryan, wearing a blue suit, was walking around the set, making sure everything was in order, but came over to warmly clasp my hands. I was the first to spot Shirley as she came up the steps & she waved hi as she waited to be seated. Once spotted, she was given a standing ovation. I also saw Sue & friend David Jolliffe, & caught brief glimpses of Shaun as he roamed the set, in a grey suit jacket over a Rockits t-shirt. Most of the family & guests were seated in front of either the living room or kitchen sets at the far left, where the majority of the action was filmed. We were asked by the comic/MC, who kept us entertained between set-ups, to try to respond to the live action on the set, but it was easier to watch the monitors, as we could see David & Patrick’s expressions better. The poor MC would just be answering a question or starting an audience participation skit, when the air-horn would blow & quiet would be called. During one of the breaks, I was able to promote Friends of the Cassidys. When Cat Ortiz stood to talk about her fan club, which disbanded 10 years ago, I waved an extra copy of mine & said I was the CURRENT one! In front of the assembled family, I mentioned how they supported us & how all the current newsletters & web-sites worked together. At the end of the taping, I received a Rockits t-shirt like Shaun was wearing. The characters of “David” & “Patrick” where written perfectly to their personalities, from David’s egotistical character, who was still cashing in on his 80’s Rockits persona, complete with Elvis-like karate kick, to Patrick’s role of a SUV dealership owner who claims to be embarrassed that his marketing dept is cashing in on his Rockits fame. Patrick’s wife is also a former member of the group, and their oldest son has musical aspirations with a bland Internet music video, and the youngest son has his own brand of creativity. Into this mix enters Ruby, “David’s” unacknowledged daughter, who left her grandparents after realizing they never remembered she lived with him. The 30-min pilot covers the first day of Ruby’s entrance into the family. The 5 scenes took 5 hours to film (even with some scenes previously taped), with re-takes, set ups, and changing lines around. One of David’s lines was twisted around, & each tongue-twister was even funnier than the last. Some takes used different versions of the same line (it will be fun to see which lines they use). At the end of the taping, David gave a touching speech, saying that if it weren’t for his brothers, he wouldn’t be there & acknowledging step-father Elliott Silverstein who was in the audience. Patrick mentioned their choreographer, Melissa (yes, there is “dancing”), & his family friend Howard Borris. Shaun talked about working with his brothers & thanked Shirley. No cameras were allowed, but I hope to work with Disney publicity to get photos for the newsletter (I also hope that some of the entertainment magazines covered this).